jennie's nails and tales: The Nail Files: Some Day Your Froggy Prince Will Come...and That Day is Today. 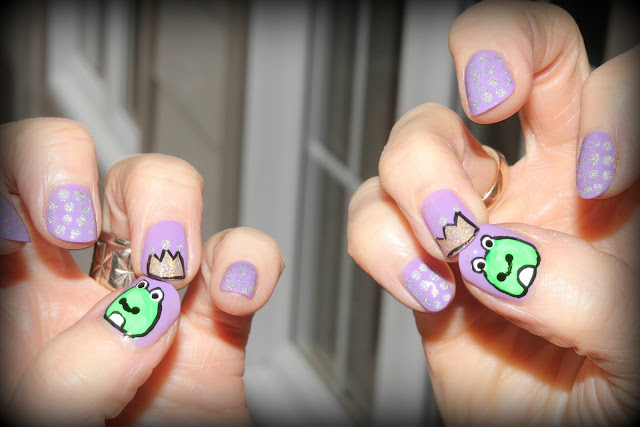 The Nail Files: Some Day Your Froggy Prince Will Come...and That Day is Today. My in-laws rolled into town on Wednesday and between hitting up all of the tourist hot spots that New Brunswick has to offer, specifically: The Covered Bridge Potato Chip Factory and the Saint John Reversing Falls, we've spent our nights hanging on the couch. Rite Stripe Black and Green, Julep Felicity, Finger Paints Paper Mâché, OPI Don't You Lilac It? and DS Coronation, China Glaze I'm Not Lion. For tools, I used a medium dotting tool, flat brush and skinny brush. One coat of Don't You Lilac It? to start on all nails. The Crown: One coat of Felicity, followed by one coat of I'm Not Lion. I outlined the crown with Black, using the brush that came with the bottle and then used DS Coronation for the crown jewels (medium dotting tool for the centre and a small dotting tool for either side). The Rest: One additional coat of Don't You Lilac It? and then dots with DS Coronation (small dotting tool). Man oh man Nail Filers, it is ONE MILLION PERCENT easier to do nail art on someone else's nails. Seriously, it made me want to paint fake nails and then just glue them onto mine. I kid, I kid...sort of. Adorable. I love that color purple. I just had a feeling that you were going to do the frog this week when I saw it pinned on your board. So cute! I like your color selections too! Now, what is the talk about a potato chip factory?!? This is awesome! You did an amazing job! OMG, this is AWESOME!! I love it! LOVE LOVE LOVE. absolutely amazing! This is quite possibly the cutest idea I've ever seen! And you did an awesome job on it! This is ADORABLE! I actually like yours better! But yeah my two fingers can't do that like the inspiration picture. Maybe it's the longer nails that helps? 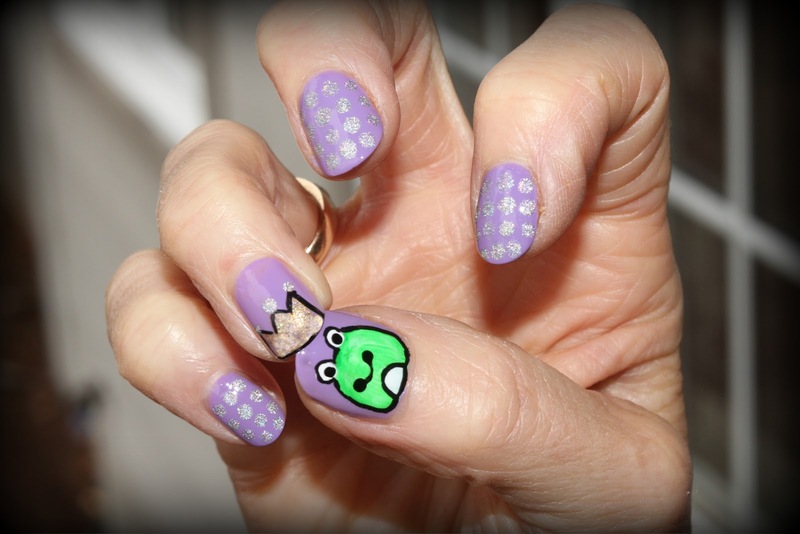 Great job with this cute mani! I think I love the purple instead of the pink :) Very very cute!